We offer lessons year round from beginner to advanced. 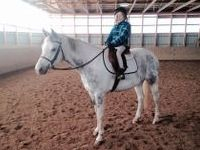 Lessons are scheduled as weekly appointments, some school horses are available. Riders who want to show are strongly encouraged to lease or buy their own horse. This allows the team to grow together and better prepares them for competition. Training is offered as individual rides or can be purchased in packages for a discount. Our training programs are customized for each horse, which helps them progress quickly.